This recipe is adapted from one of my favorite cookbooks, Madhur Jaffrey's World Vegetarian. Spicy lentils. Garlicy mushrooms. Fresh herbs. Tangy yogurt. Crunchy onions. Heavenly! Pick over lentils and wash in several changes of water. Drain. Put 3 tbsp. oil in medium saute pan over medium-high heat. Add onions. Stir and fry, turning heat down and adding olive oil as needed, until onion is brown and crisp. Remove onion with slotted spoon and spread out on paper towel. Put red chile and garlic into oil remaining in pan. Stir for 10 seconds and add lentils and 2 1/2 cups water. Bring to boil. Turn heat to low and partially cover pan. Cook gently for 30-35 minutes, or until lentils are tender. Remove red chile if desired. Add salt and pepper and stir. Cut mushrooms lengthwise into slices that include stem. Put 1/4 cup olive oil in a large frying pan or wok over high heat. Add garlic. Stir once and add mushrooms. Stir and fry until mushrooms have wilted. Add salt, pepper and cayenne. Stir. Add 4 tbsp. parsley. Stir again and turn off heat. 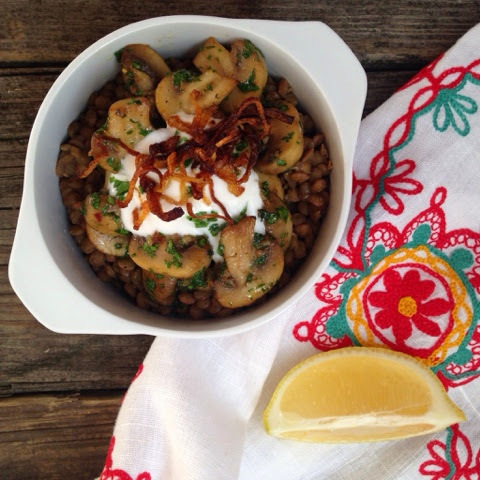 Serve hot in bowls, with lentils as bottom layer, mushrooms heaped on top of lentils, and a final dollop of yogurt. Sprinkle browned onions over yogurt and remaining parsley over very top. Offer lemon wedge on side.